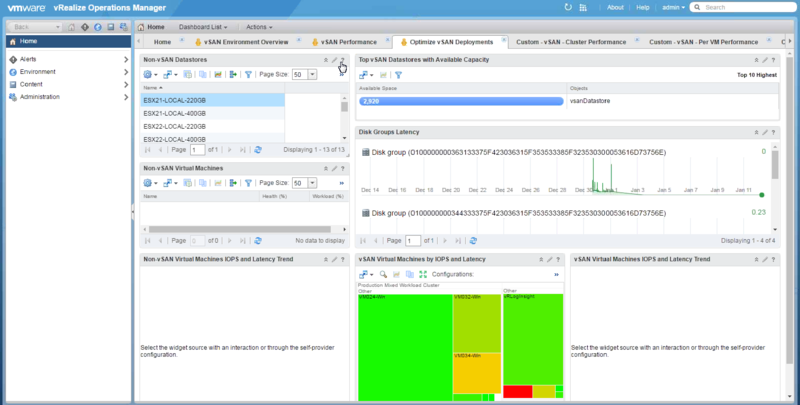 This new vSAN Management Pack focuses on 3 main areas of vSAN: (1) Health and Availability, (2) Performance Analysis and (3) Capacity Planning. The goal of the pack is to give you confidence that vSAN is behaving as expected during day-to-day operations, but if an error does occur, help you to troubleshoot it quickly. Lastly, we want you to be able to monitor usage of resources on the vSAN cluster. And you can also see a number of custom dashboards here as well. The beauty of vROps is that you can build you own custom dashboards to highlight what you feel you need visibility into. For example, as my colleague Pete Koehler highlighted in this blog post here, you may wish to compare workloads running on traditional datastores to workloads running on a vSAN datastore. Custom dashboards can give you a side-by-side comparison of these VM workloads. But even without the custom dashboards, the default dashboards provide a wealth of information. This is an example of a vSAN Environment Overview, which displays the layout of this 4-node all-flash vSAN cluster, along with any outstanding alerts. Alerts can also be examined in more detail, or indeed acknowledged from this view. Then of course there is the vSAN Performance views. You can look at performance from a VM perspective, disk group perspective and host perspective. Selecting one particular object enables widgets that will give you additional information about that object. For example, below I have selected a VM with in turn displays Latency and IOPS for that VM/VMDK. Further down, if a particular Disk Group is selected, I can get details about that disk group’s write buffer performance. The final default view is the Optimize vSAN Deployment view. This provides further details around both vSAN and non-vSAN datastores. 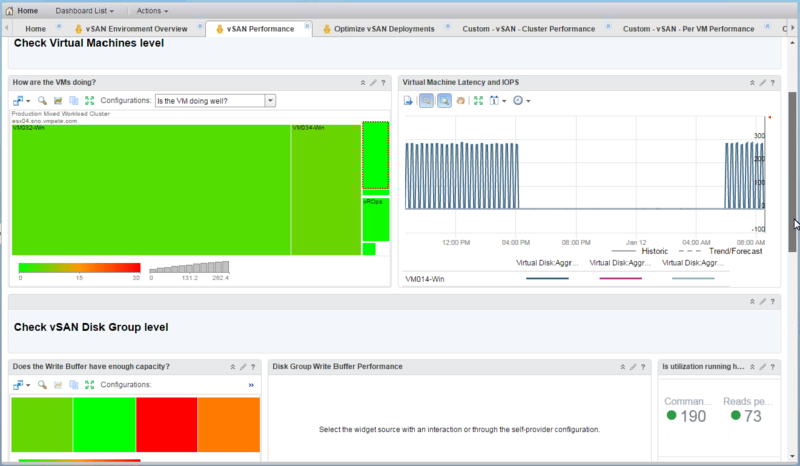 This is a great screen for examining capacity usage, as well as workloads, both from a vSAN and non-vSAN perspective. My understanding is that the vSAN Management Pack (stand-alone) is available with vROps version 6.4 (standard edition) and later. The vSAN management pack works with vSAN version 6.2 and 6.5 (and presumably any later versions). You can get the vSAN management pack from Solutions Exchange. For those of you with vSAN deployments and who are also using vROps, this is a great addition to your management portfolio. 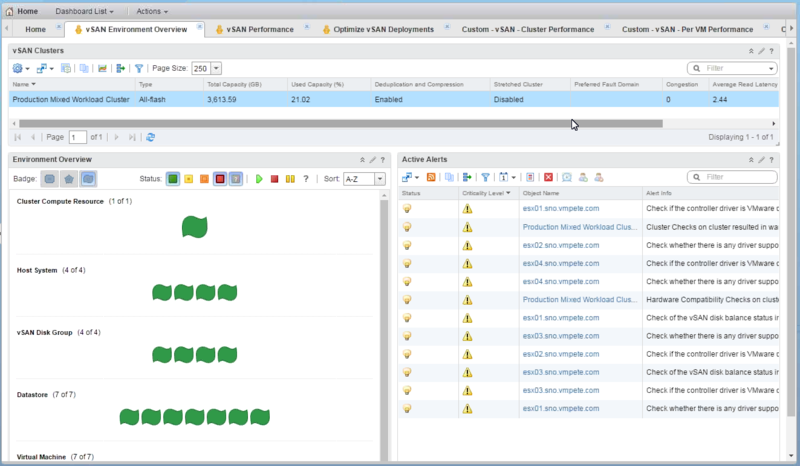 And just before I went live with this post, Pete informed me of a new click-thru demo showing how to use the new vSAN management pack to validate workload migrations. You can check it out on storagehub. Nice job Pete. The mgmt pack link isn’t working. I will update the link in the post too. Thanks for the heads-up.